This documentation is no longer being updated. The up-to-date version of the wiki documentation can be found here. 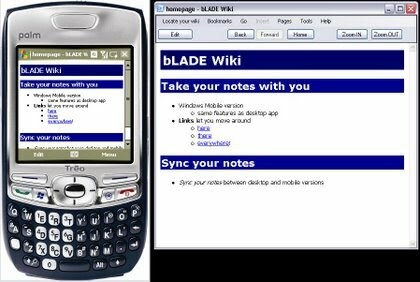 bLADE Wiki is a personal wiki to let you take and manage your notes. It runs on Windows and Windows Mobile - and can sync between the two. Or you can run it on Windows from a USB memory stick. Either way, take your information with you - wherever you are! Wikis are a great way to take and organise your notes. The syntax is simple enough that it doesn't take too long or get in the way of getting your thoughts into the wiki, but powerful enough to make attractive and well-organised notes. Why not use an online, hosted wiki? Because you're not always online. Particularly when mobile. For personal notes intended only for you, taking the notes with you (either on a USB stick or a mobile device) is just as effective. Can I use this with Getting Things Done? There is something about a wiki that seems to lend itself well to the ubiquitous capture mentality of GTD. bLADE Wiki is a lightweight app that lets you capture and organise your thoughts, and so makes a good companion to a GTD system. Some of the features, such as backlinks, were provided to make GTD implementations easier.